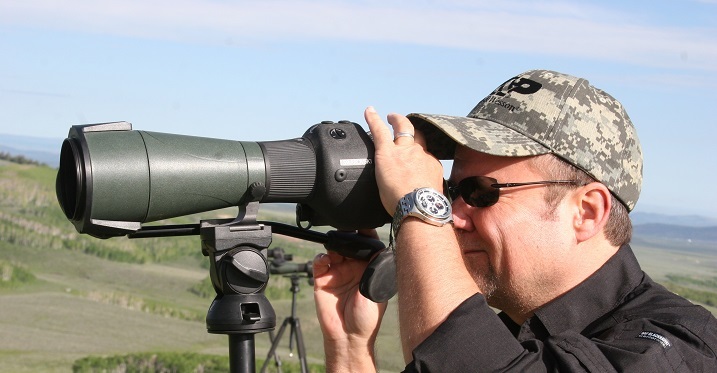 The spotting scope is front and center in terms of necessary gear when talking about big game hunting, long-range shooting, or any other field observation that requires long-distance equipment. Without this, you’re just shooting or hunting blind. 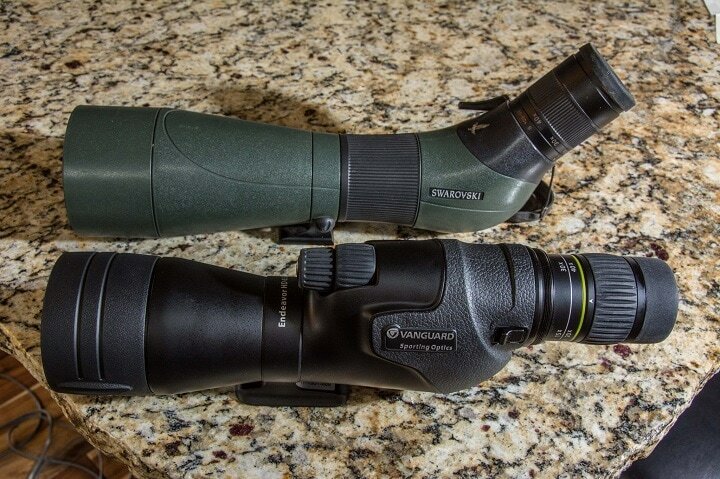 Because the general spotting scope is offered in so many different styles, taking the time to think about the purchase of a scope can save you a good deal of grief in the long run. Sometimes the answer as to which is the best scope for you is difficult to find. It is my hope that I can give you useful information to enable you to begin a successful venture into the game of long-range shooting.. 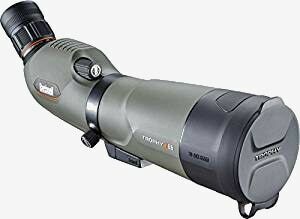 In my opinion, one of the very best spotting scopes built today that is still affordable for the serious shooter is the Swarovski product. 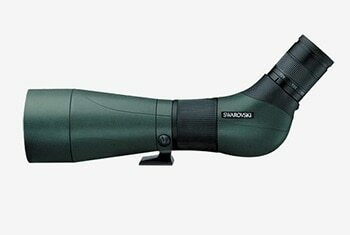 Because a spotting scope must extend its performance range well past the normal deer hunter’s needs, the price goes up. The scope needs to have the ability to stay on task and meet the requirements of ultra-long-range target identification. This requirement requires very good optics glass, internal parts, and an ability to stand up to weather conditions that could affect the tube’s performance. If you’re going to shoot at ranges that don't require high- powered glass, you should stay with binoculars or your scope sight. 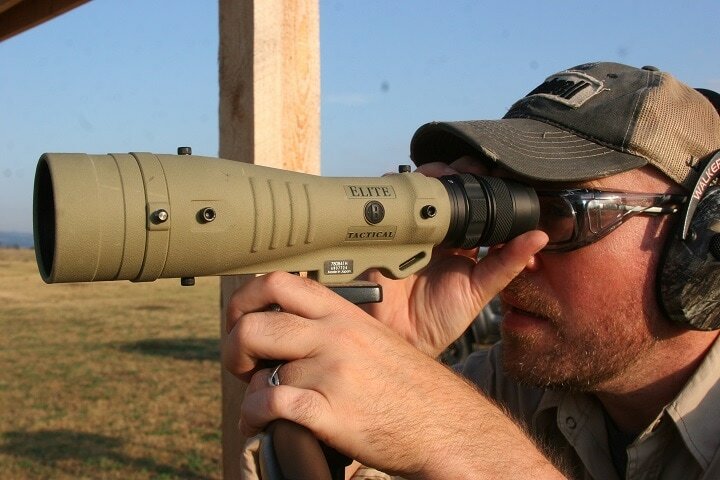 The Swarovski ATS retains an aluminum body for weight reduction to offset the glass being quite heavy due to the quality lens required for the job it must do down range. 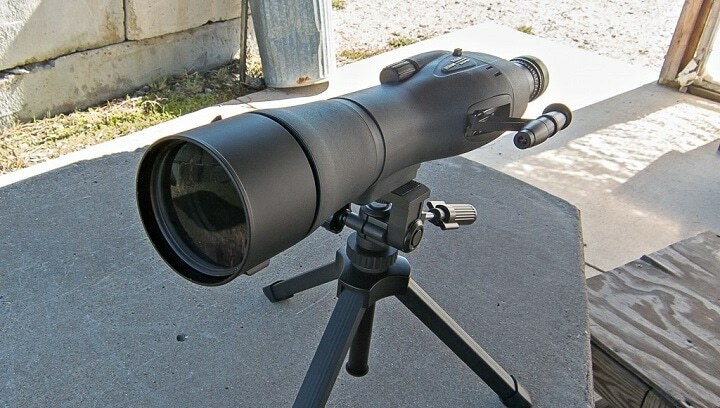 These scopes can be obtained with a straight or angled body, depending on the shooter’s preferences. Target guys like to sit and look down through their scope and require the angled body. One outstanding element associated with the Swarovski glass is that it can be ordered with matching sub tensions etched in the lens that it will correspond to the same MOA mil dots indicated in the rifle scope. In this case, a spotter can call a correction to the shooter and both are on the very same page without any guesswork. When the spotter says two mils left and three down, the correction is instant because the shooter and spotter are looking at the very same sight picture. 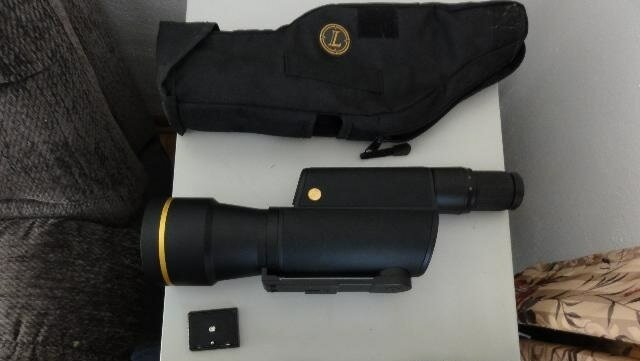 I have used this system with three scopes high in the mountains of Utah in the NRA Long-Range Big Game (elk) Shooting School with very positive results. 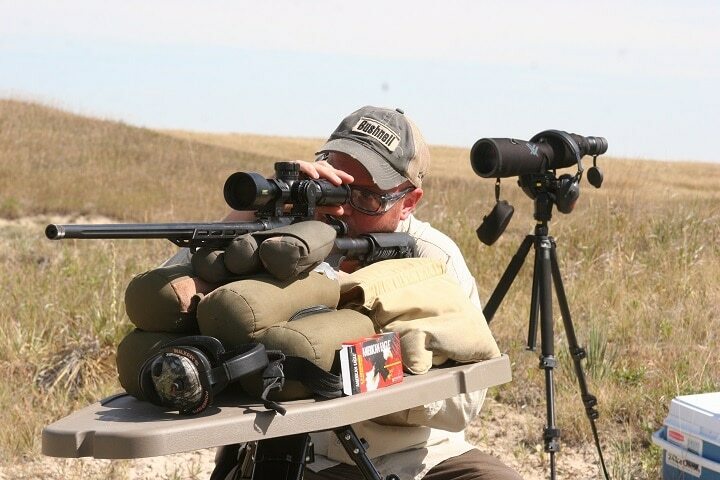 The Sisk rifle camps that were held here in western South Dakota made use of the same system for some 1000- through 1400-yard shooting when test shooting the Sisk 308 sniper turn bolt rifles. The price of Swarovski HD-ATS varies, so check the latest price at Amazon. Watch out, shooters, because Bushnell is on the fast track to great quality and upper-end innovations with the latest and greatest optics. Spotting scopes, like everything else in this company, have received a makeover of sorts and are worth looking at. 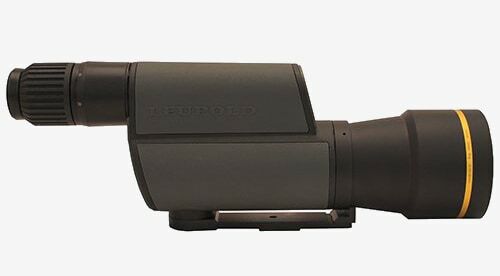 The Bushnell Trophy Extreme spotting scope retains a 45-degree eye piece and 20-60x65 mm objective that is protected by a built-in cover. It is green with a compact window mount included. The scope is offered with a quality hard-side waterproof carrying case. The price will dictate the range of this scope. I have tested this optic to 600 yards with reasonable results. Like rifle scopes, spotting scopes increase in price for every yard beyond 400, and so you will get what you pay for almost all the time. 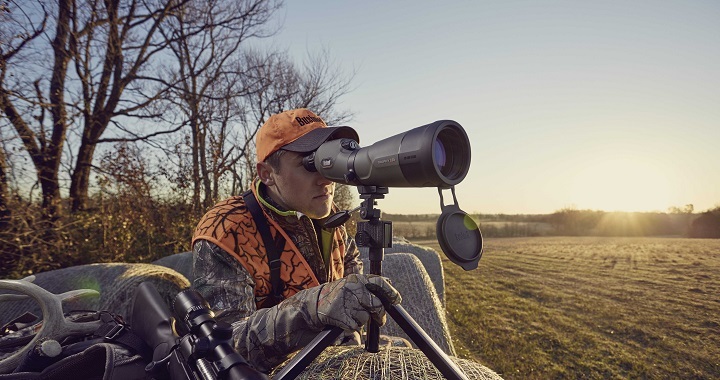 The price of Bushnell Trophy Xtreme varies, so check the latest price at Amazon. 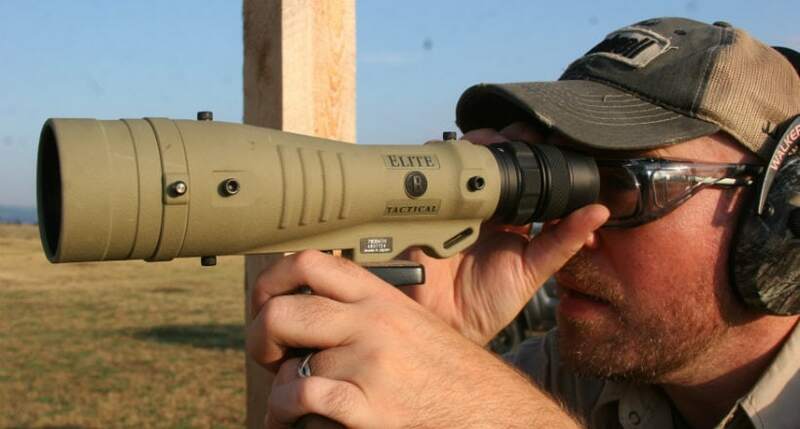 Bushnell “Elite Tactical”. 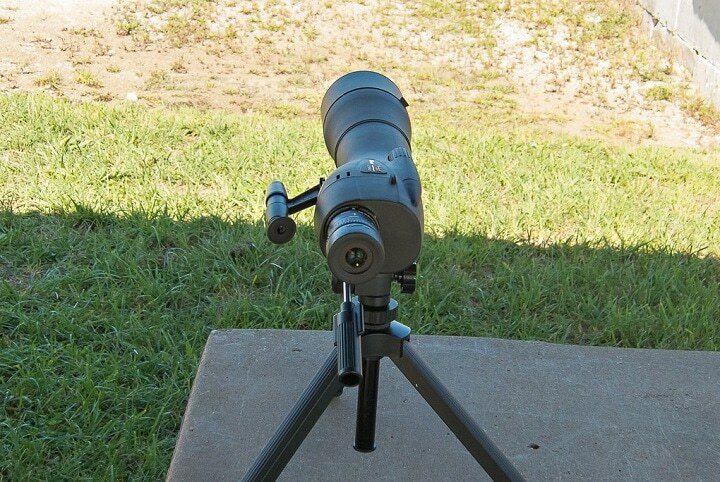 This scope is designed for long-range (1000 yard) work as a hunter’s grade field option. This is a good unit for medium long-range work inside 800 yards. After that, weather conditions such as mirage, blowing dust, heavy wet air will interrupt positive function and will cause loss of optical quality down-range. In good conditions, 1​00- yard efficiency is possible. The price of Bushnell Elite Tactical LMSS varies, so check the latest price at Amazon. Nikon offers a complete spotting scope kit that includes scope, eyepiece, tripod, clamp-mount window, smartphone adaptor, and cleaning kit. Nikon is another company listed here that is on the move. 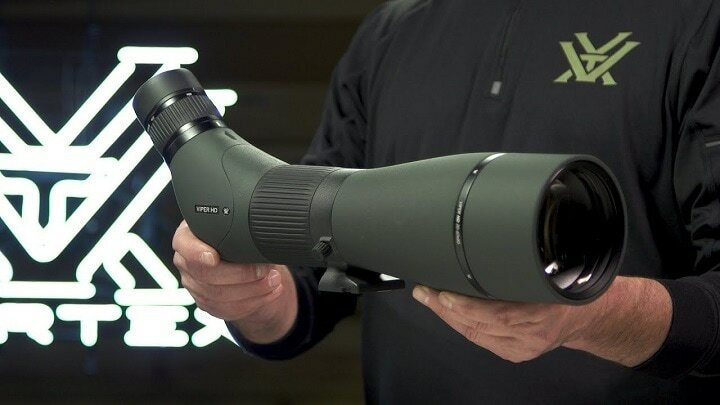 Believe me, I have been testing their products, and these folks are building quality glass systems at half the going market price for better grade spotting scopes. Add ranging and rifle glass into the mix and you have a very major player in the industry. I would suggest this unit for shooting application out to 400- or ever 600 yards, based on the development level of the optics system. However, this company can be full of surprises. The price of Nikon Prostaff 5 varies, so check the latest price at Amazon. 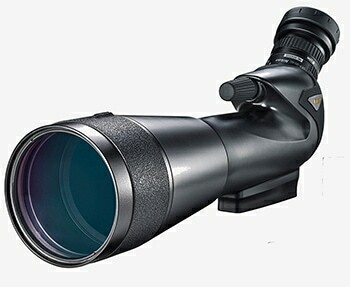 The scope has 15-45x65 power with a straight or angled constructed tube. I have set up my Viper with a spotter, and his job has been to locate bullet impact (splash) at up to 1000 yards. Dry ground can make this happen, and I can adjust my additional shots for proper impact. Sighting bullet holes in paper is not going to happen, however, at that indicated range limit. How do I fix the problem? Buy more glass for far more money. It is a very simple equation. 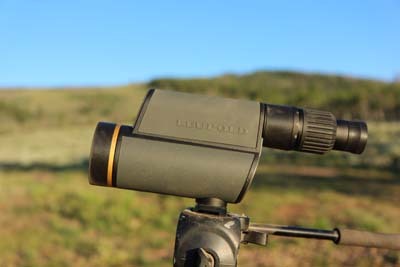 Leupold builds some very high quality spotting scopes and these are a very reliable operation system in the Rocky Mountains when on a sheep hunt or picking out the bull of the gang way down deep in an elk valley draw. 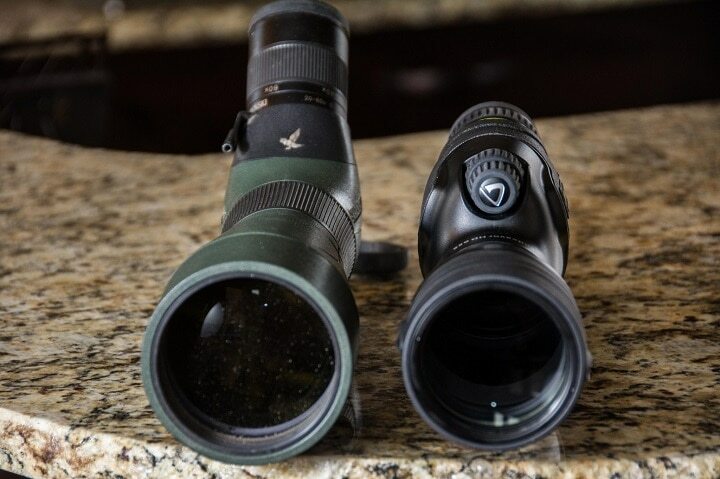 These scopes are designed for very serious hunters or those involved as guide services where every hour in the field is costing someone a lot of money. The scope is shadow gray with an impact reticle. This system is designed to be packed into rough back country for some serious business down range. It includes a hard-side case and a tripod. Super high resolution regarding light transmission and the system makes use of a series of mirrors to compact the length of the lens and internal systems. Actual magnification is low 20 through high 60.00 times. 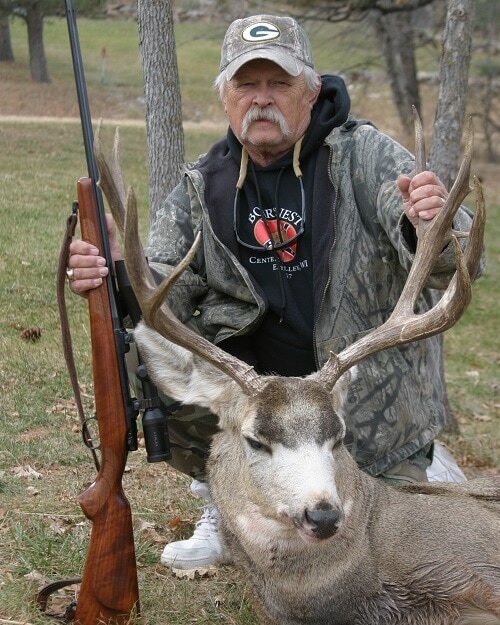 The scope has an extended twilight system for clear view in low light in those late or early moving elk or deer. 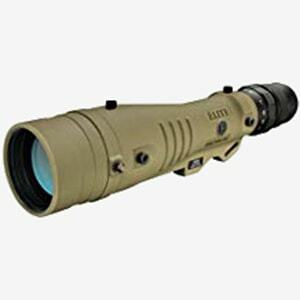 Bargain basement spotting scopes in that $75.00 to $300.00-dollar range do not cut it for long-range work in hunting camp or at targets. You’re throwing your money away on them because they don't work well at all. At the range they offer, you’re just a well off using the scope on your rifle or travel-sized binoculars. In almost all cases, you’re far better off with better quality products. What I won't do here is fill you will a lot of bad information. You need to know the facts in order to make the best decision you can. This guy was picked up in a spotting scope from a static hide location at about 550 yards. He was killed at 425 yards or when he made a turn for a big high-grass swamp. The spotting scope first located him and then stayed with the target all the way through the shot. Selecting from the varied styles of spotting scopes like the ones I have reviewed here will allow you the option of getting into several dozen scope systems. Power settings, price, and related quality are going to be the driving force behind your success with any one of these brands. The shooter is a Bushnell staff guy; the rifle is a Savage chassis rifle in 6.5 Creedmoor; and the spotting scope in the background is mine. The spotting scope is a Vortex Viper, and we are shooting 600 yards down-range. Everything is working just fine. 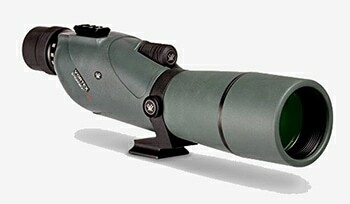 Here is one hint I can give you regarding the search for a spotting scope that will work for you. Get that glass out into the daylight and on an object well down-range. Move up your magnification level and see if the target blurs out at all. When you can't adjust a clear image, you will know the max effective range of that spotting scope. And if you want to polish your skill of long range shooting or even if you are a beginner enroll in my 7 days course on long-range shooting. This free series of quick and easy-to-read lessons will assist you a great deal to have your first 1,000 yards shot. And after that course, if you'd like to learn more then you can get my long-range book being offered by Huntingmark. My book will take you all the way out to one mile and beyond with regards to effective ultra-long-range shooting. 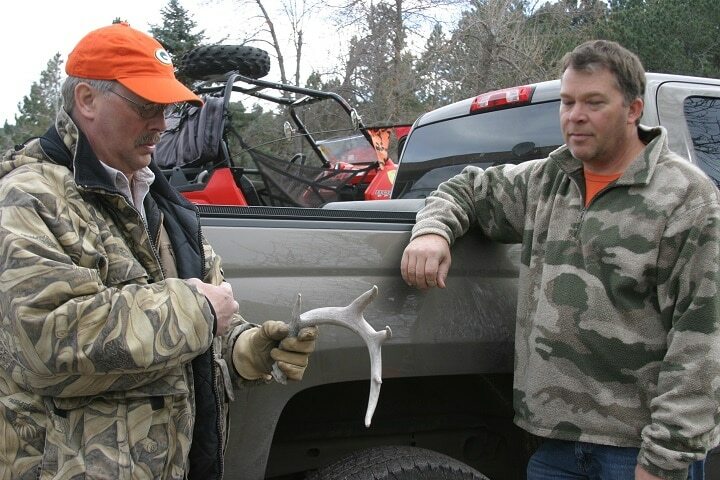 Hunters check found year-old rack. Judging by its size, there were some good deer in area. Now it is time to set up on high ground and start spotting for a good clean in-range shot.